The global, annual-mean surface temperature is the most widely used measure of climate change. In particular, scientists are very interested in how the globally averaged temperature will respond as a function of changed amounts of greenhouse gases in the atmosphere, changed amount of solar intensity, etc. The term “climate sensitivity” refers to how much temperature change the planet experiences from a given “forcing.” A forcing is an imposed change of the planet’s energy balance with space. A feedback is something that amplifies or dampens a response. It doesn’t start a change on its own, but can push a pre-existing change farther away, or closer to initial conditions. An example of a negative feedback is a furnace, which shuts on and off to stabilize the temperature to a certain value. An example of a positive feedback is world population at a fixed growth rate– until held in check; we’re going to keep having people. where λ is a function of the column distribution of water vapor, temperature, specific cloud properties, and surface albedo and λ is separated into shortwave and longwave components. If λ turns out to be a number greater (smaller) than 0.3 K/W/m2 then we can say the net effect of feedbacks is to be positive (negative). The best real-world value is approximately 0.75 K/W/m2 so this means that feedbacks are, on net, amplifiers of initial forcing mechanisms. where n could go to infinity, but insofar as “f” is 0 ≤ f < 1 the whole series will converge, so as to produce no runaway warming scenario. All a positive feedback means is that warming will be amplified, so that the change is greater than the “all other things equal” case. Let’s talk about specific feedbacks and what they are. where Pi and Ti are reference saturation pressures and temperatures, such as at the freezing point. Because of the exponential, the formula predicts a strong dependence on temperature. It turns out that atmospheric motions keep the atmosphere from being fully saturated, but models and observations seem to suggest a nearly constant global relative humidity as the planet warms, so the saturation pressure will go up roughly 7% per degree of warming. Because gaseous water is a very effective greenhouse gas, this means a positive feedback and a further enhancement of the greenhouse effect. Water vapor also absorbs solar radiation, and the enhanced absorption under moister climates provides a smaller contribution to the total feedback from water vapor, but it’s still important. The shortwave effect is smaller than the longwave effect by nearly an order of magnitude except at the poles where absorption of upwelling reflected radiation becomes important. Increased water vapor acts to increase the net incoming solar radiation, and the shortwave sensitivity is largest in the lower levels of the atmosphere because of the weaker line strengths in the solar part of the spectrum. Nearly all of the overall water vapor effect occurs in the troposphere, with most of that occurring in the tropics. The increase of water vapor with temperature reduces the slope of the Outgoing Radiation vs. temperature curve, making the climate more sensitive to radiative forcing of all sorts. The water vapor feedback is the most powerful of all feedbacks. The global albedo is influenced by both the atmosphere (clouds, aerosols, etc) as well as the surface. Albedo is simply a measure of reflectivity. Ice and clouds are highly reflective, land and ocean are less reflective. Anytime we sat in a black car in summer, we develop an intuitive basis for the impotance of solar absorption. The slope of albedo vs. temperature is large when the temperature is low and the planet is nearly ice-covered, and approaches zero in an ice-free case. However, the bulk of Earth’s albedo comes from clouds. Clouds also act to mask the effects of any underlying change in surface albedo. I will discuss clouds separately from this post, so for here, there’s just a focus on surface albedo. The albedo feedback is perhaps the easiest to understand, as it is very easy to visualize and explain. Suppose you have a room where 50% of the floor is covered by a reflective material A, and 50% by a non-reflective material B. Now suppose we shine a light down from ceiling on to the floor and monitor absorption and reflection. Assuming perfect albedos (0 and 1), 50% of the light will be absorbed by the floor and 50% will be reflected back toward the ceiling. Now suppose we change the ratio of the makeup of the floor such that 75% is now composed on B, and 25% by A. We now expect a much lower albedo for the whole floor, so that overall, there is more absorption of the incoming light. Under a global warming situation, we expect less ice. We might expect more desert cover. These things will act to change the surface albedo. In particular, less reflective ice means more absorption of solar radiation, while leads to an overall positive feedback. This effect is one of the reasons that the poles warm faster than lower, tropical areas. The strength of the greenhouse effect is dependent on the fact temperature decreases with altitude, to the point where there is little to no greenhouse effect in an isothermal atmosphere. Under an assumption that the vertical temperature profile is given by the moist adiabat, there is a weakening of the temperature differential between the surface and air aloft. This feedback tends to be negative in the tropics, positive at the poles, with a net negative effect. 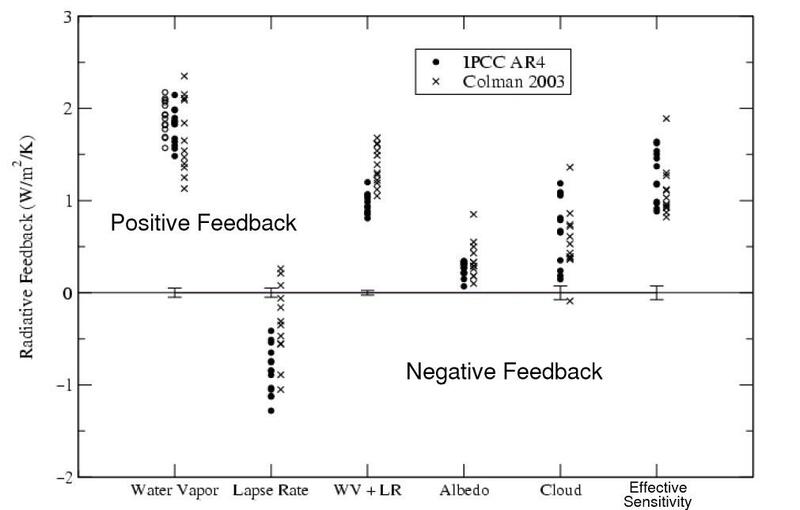 With reduction in tropical lapse-rate and resulting increase in Planck emission per unit warming of the surface, this feedback partially offsets the water vapor feedback. From this perspective, you can see that if those people who argue that the tropical atmosphere is not warming as fast as the surface, the result of their implications would actually be toward an increased climate sensitivity. Climate sensitivity is just a number. It could be a constant or it might vary as boundary conditions vary. It could be a probability distribution. However, it says little about how sensitive things in general are to a given change. For instance, if we think outside temperature, arctic sea ice is currently retreating faster than modeled. Unless that has unknown and substantial implications for albedo or cloud responses, it doesn’t actually effect the temperature change between two climate states. Greenland ice sheet retreat depends on lots of ice dynamics, calving, lubrication effects, precipitation, etc… not just the ambient temperature. It might be that uncertanties in those first things make it more vulnerbale to collapse than we think. This doesn’t mean anything to the algebra–However, for practical application, it can have a lot of meaning…it can matter for navigation purposes, ecological responses, etc. Is a planet with highly responsive sea ice/Greenland less sensitive than a planet with sea ice that won’t budge even if it has a greater value for “λ?” The same can be said about extreme events, changes in the hydrolic cycle, etc. A larger number for global climate sensitivity will probably translate into larger local effects, but people are sensitive to local changes and the responses to global warming. As Michael Tobis discusses here there are far more important questions to address. The problem is we really don’t know how much things are going to change, even if we know how the global mean temperature responds. We need much more investigation as to how the real world (like Joe the Plumber) is effected by climate change, since arguing over a number is not very productive. How sensitive things are, from this perspective, is inherently a subjective statement…or it can be placed on a 1-10 scale, or something along those lines. There is no universally recognized way to quantify species loss. The misleading nature of simle numerical answers is that it does not highlight how much people are going to be effected, because there is no numerical impact factor. These things need to be portrayed to the public. This entry was posted in ecology/impacts, scientific basis, what is global warming?. Bookmark the permalink. Thanks so much for taking the time to write this. I like these articles that are about half way between the general explanations and the nitty gritty math, that frankly, is beyond me. 1) you mention that “atmospheric motions keep the atmosphere from being fully saturated”. I’d like to know more about why H2O is short-lived and therefore a feedback and why CO2 is long-lived, well-mixed, though heavier than other gases. These are such basic concepts to climatologists, but when I find myself saying “H2O is short-lived”, I then have trouble saying why. I assumed that water vapor doesn’t reach saturation point because at ambient temperature and pressure it so readily changes state and falls out of the air (dew, water, snow), and is easily absorbed by vegetation and soil. 2) What do you mean by “weaker line strengths in the solar part of the spectrum”? 3) And last, I followed you here from your comment on Tamino’s blog, where you asked about “primary references on discussion of Milankovitch cycles from a more mathematical basis” I would love to read what you have to say on this topic when you’re ready. Response– Very good questions actually. Whether a gas is “long-lived” or “short-lived” depends on environmental conditions. Atmospheric gaseous H2O is more of a feedback because on Earth it condenses into clouds easily. So essentially if you keep adding CO2 the temperature conditions on Earth allow that CO2 to keep building up. On Mars, CO2 is more short-lived because the planet experiences much different conditions, and it gets cold enough to the point where CO2 can condense. On the other hand, the atmosphere has an infinite source of water vapor (the ocean) but it doesn’t continue to build up, because once you hit the saturation pressure, that’s it, you get a cloud and eventually it comes down as precipitation. That’s just the water cycle in grade school science. However, it turns out that for every three degrees of warming on Earth, you get about a 20% increase in the saturation vapor pressure…so that’s why it’s a positive feedback. CO2 can be a feedback on Earth depending on conditions of the oceans and biosphere, it’s just that significant changes to these things occur on a transition timescale much longer than the fossil fuel input in the 20th century. 2) In simple language, I just mean that the water vapor absoprtion in the infrared is of greater significance than its absoprtion in the visible.